Breezes Beach Club & Spa is located on the most private untouched beach of the enchanting Island of Zanzibar making it a perfect getaway retreat. With pristine white sandy beaches, rustling palm trees, exquisite attention to detail and genuine hospitality, this exotic resort has captured the very essence of Zanzibari style. It reflects the Island's natural beauty with stunning carvings, glistening brass and rich fabrics, creating a casual elegance and unique atmosphere. All rooms are tastefully decorated in ivory tones, with cotton throws, teak wood finishes and Zanzibar carvings, are fully air-conditioned with ensuite bathrooms. All rooms have a refrigerator and personal electronic safe box and hairdryer in bathroom. All rooms have a full third bed functioning as a sofa. There are three room categories:Deluxe rooms and Suites are in close proximity to the sea. Standard Rooms are located further away from the sea on the property with a terrace and garden view. Standard and Deluxe are identical in terms of décor and size. Deluxe Rooms are located on ground floor of bungalows with terrace. Suites are located on upper floor of bungalows with large balcony and sun beds. The Suites have a walk in dressing room and larger bathroom with large terrace, private sunbathing area, and a covered outdoorlounge area. Salama dining room - Serves a delicious breakfast buffet and three table service dinners alternating with exotically themed buffets. The Breakers Grill - This is the Breezes lunch restaurant serving fresh barbecue and catch of the day served on the beachfront under the shade of the palm trees. Live open grill and tandoori oven. The Tides - Private beachfront dining for two in an intimate setting overlooking the India Ocean, offering personalized service and a special menu for two. The Sultans Table - A fusion of Indian and Swahili spices and the very best seafood in a stunning venue overlooking the Indian Ocean. The Safari Bar - The Safari Bar offers a relaxed candlelit atmosphere in the evenings. 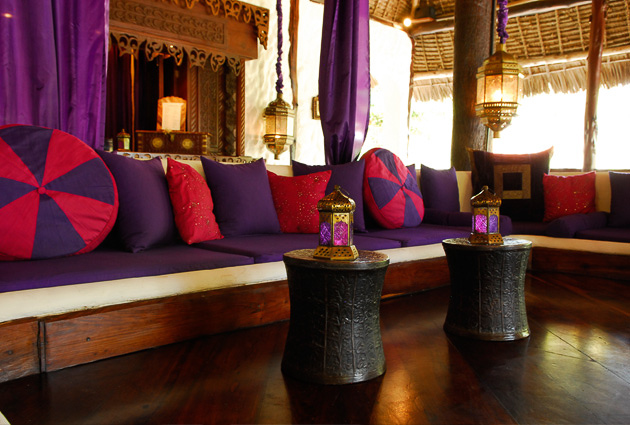 The Dhow Bar / Pool Bar - The Pool Bar, is an ideal retreat from the sun during the day. The Baraza Bar - Our Fine Whisky and Liqueur Bar complete with a selection of cigars in a stunning Swahili Baraza. The Chai Room - Coffee tea and cakes served every day in the relaxing Tea and coffee lounge with Zanzibari beds. Breezes Beach Club & Spa is delighted to introduce our sanctuary of Spiritual Fitness for yoga and meditation. This beautifully decorated setting enhanced with candlelight and incense is the perfect tranquil retreat… the first of it’s kind on the island of Zanzibar. Offering a range of marine activities ranging from Beach Volleyball, Pedal boats, canoes to daily snorkeling trips to the lagoon by boat, windsurfing and sailing. Breezes is home to one of Zanzibar’s most professional and experienced diving operations. The Rising Sun Dive Center, which is a licensed PADI dive center, offers all diving services from beginners to advanced diving. Our experienced diving instructors provide personalized instruction on a one to one basis while experienced divers can enjoy the fascinating marine life of the south east coast of Zanzibar. The shopping bazaar offers an excellent selection of antiques, souvenirs and African Arts and Crafts. The fitness center features start of the art gym equipment with personalized instruction. It is possible to change money at the cashier’s office. Traveler’s cheques, cash, MasterCard, Visa and Euro card are all accepted for settling payments. There are no telephones in the rooms however phone and fax services are available at the reception. We offer, among other tours and excursions, the unique Swahili Day. All tours and transfers are organised through the services of a fully licensed and registered tour operator.